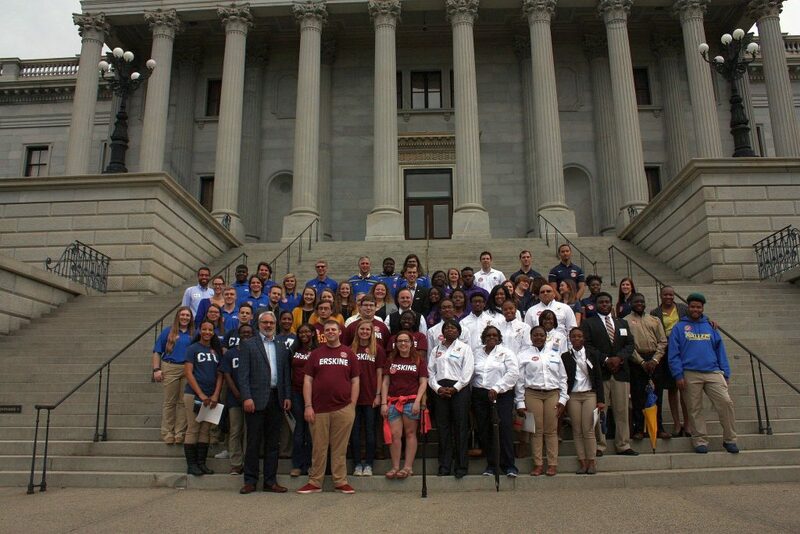 COLUMBIA, SC — Students from SCICU member colleges and universities converged on the South Carolina State House on Independent College and University Day (Wednesday, April 5, 2017, as jointly proclaimed by the SC General Assembly and Governor Henry McMaster) to thank their Representatives and Senators for funding and support of tuition grants. This advocacy event culminated a four-month letter-writing campaign in which nearly 4,000 tuition grant recipients attending SCICU member colleges and universities wrote more than 7,000 letters to South Carolina legislators in appreciation for their tuition grants. Prior to visiting legislators at the State House, SCICU students gathered at Satterlee Hall of Trinity Episcopal Cathedral for a welcome and advocacy warmup with SCICU President and CEO Mike LeFever. During the warmup, LeFever presented a 2017 SCICU Legislative Champion honor to Sen. John L. Scott, Jr. of Columbia. Representative Gilda Cobb-Hunter of Orangeburg was presented with 2017 SCICU Legislative Champion honors later in the day outside the House chambers. Please click here to read more about Rep. Cobb-Hunter’s and Sen. Scott’s support of independent higher education in South Carolina. Mr. Earl Mayo, Director of the South Carolina Tuition Grants Commission, also greeted students and thanked them for their tuition grants advocacy. In the annual legislative letter writing competition, Anderson University, with 1,778 letters written, continued as the top letter-writing college/university. Anderson University also won the 2016 letter writing competition. Erskine College and Allen University were honored for having 100% of their respective tuition grant recipients write letters to members of the General Assembly.